Inadequate installation & poorly handled skylight repairs are usually the reason why skylights develop leaks. You can avoid all these problems with the help from your trusted local roof repair contractor. 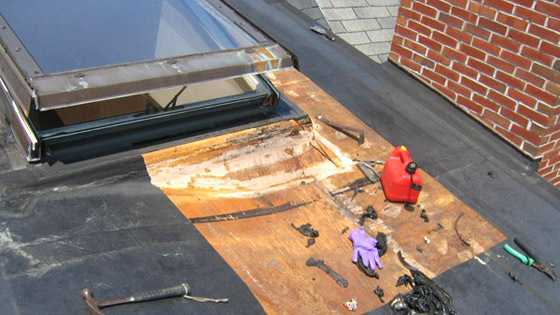 Leaky skylight repair can be tricky and should always be handled by a professional. Yet, rather than paying a professional roofer to install or repair your skylights, many people opt to hire an inexperienced handyman or attempt to handle it on their own. This often leads to costly problems down the road. Family-owned and operated, we are a reputable roofer known for our honesty, integrity and cost-effective pricing. If you are planning to install a skylight or need to repair a leak before serious damage occurs, contact LGC Roofing, your local NJ roofing contractor with over 25 years of experience. We start with a thorough inspection of your skylight to evaluate the damage then proceed with appropriate repair options. Call us at 609-712-8157 or request a Free Skylight Repair Estimate online. Improperly installed fasteners: When roofing nails are exposed to the elements, water may seep in around them. Rusty or loose nails and skylight fasteners should be replaced and sealed with waterproof roofing cement. Poor flashing seals: In addition to improperly installed roofing nails, the flashing around your skylight may not be flush and secure. Glass micro-fractures or fissures: As your skylight ages, tiny, hairline cracks may develop around its edges. While these cracks don’t look like much to the naked eye, they allow moisture into your home. If there are a large number of offending cracks, you may need an entire skylight replacement. Some small fissures can be repaired, though. Sealant failure due to thermal expansion: If you live in a climate where door and window frames tend to expand from the heat, your skylight may have the same issue. Even the best roof cement can pull away during repetitive temperature changes. This constant “stretching” of your skylight’s frame may allow moisture to seep in around the edges. Request a skylight installation or repair estimate for your home in just 20 seconds.